About 3 months ago there was a reasonably bad storm & our back fence went from being a bit knackered but still adequate to being mostly fallen down. It looked a bit like it had been an amateur job before (like a lot of things round our house ... we think one of our predecessors here must've been a DIY enthusiast) and we kinda wanted one that would stay up if the wind blew next time, so we decided to get professional fence people in. It'd've been nice if it had been covered by our house insurance, but unfortunately that'd mean insurance companies would have to pay money out more of the time, so no-one seems to cover storm damage to fences. Still we decided to go on with actually hiring people to do the job. You'd think, given the talk about the credit crunch and the doom & gloom in the press, that it would be easy to find a company willing to take a reasonably substantial sum of money to do a 2 day job ... but no, it was not that simple. The two companies that we had recommendations for turned down the job - one by actually turning it down, one by stopping returning my calls :/ So we picked a couple, at random pretty much, out of the Yellow Pages, both of whom actually got round to quotes. So now we had someone to do it we just had to wait till he could actually get time to do the job - obviously as he actually gave quotes to people he was pretty booked up & the cruddy weather didn't help. 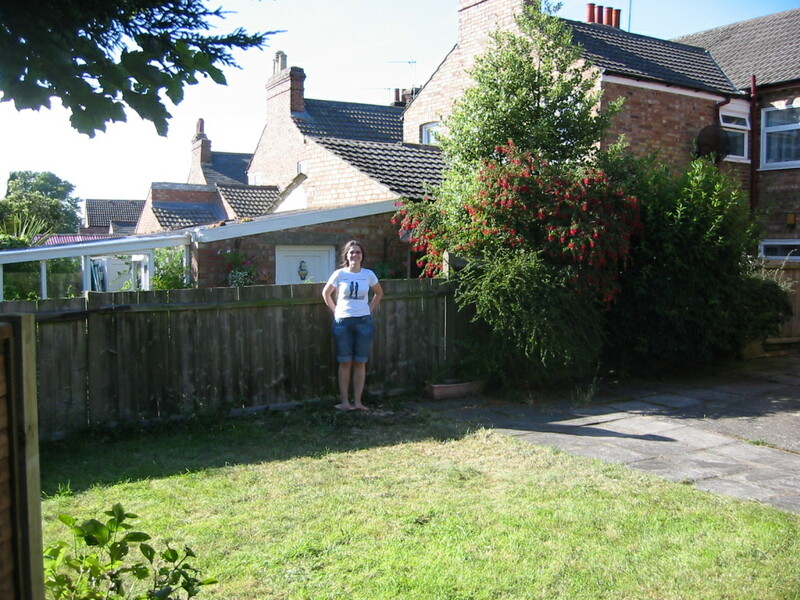 But finally last week they came & got rid out of the crappy old fence & the leylandii that were in front of it, and put a nice sturdy new fence up (and concreted the posts in, which is the bit that I don't think we'd've been at all successful at if we'd tried it ourselves ;) ). Also - not quite on a whim, but nearly - we got them to take out a tree that had been in the corner of the lawn. When we'd moved in it had been ~6 foot tall, which was OK, if a little large. But over the last 6 years it had grown to be as tall as the house ... and the fence guys were saying these sorts of trees (spruce? indian <something>?) can reach 200 foot!! Not only would that be too big, but it was spiky & wide and sucking up lots of water that the grass really could be doing with. So out it came. The garden looks better now - kinda unfinished, but a lot better. J's folks are coming next weekend bearing plants and gardening expertise & we're going to do something with the border that used to have the leylandii things. And probably buy a plant pot of an ornamental variety & put it on the tree stump. 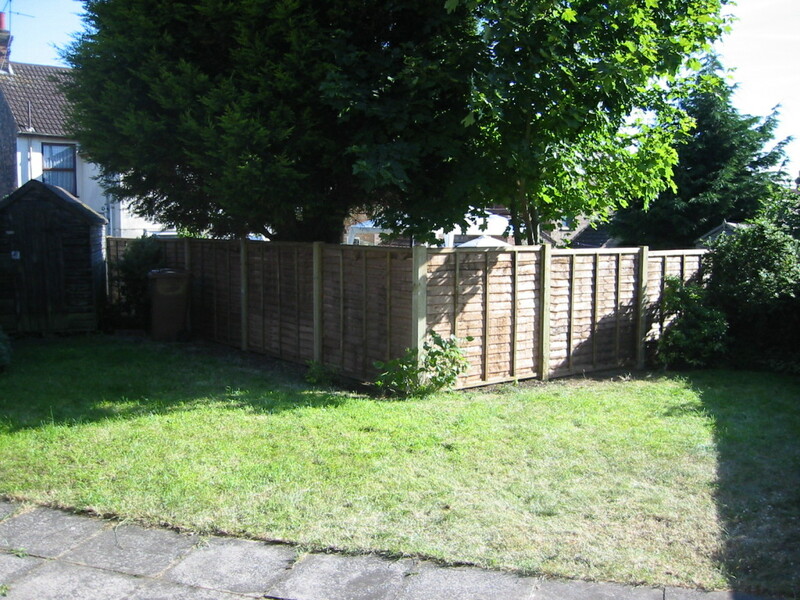 Oh, and we'd thoroughly recommend MJH Garden & Tree Services, if you live in Ipswich & want a fence. 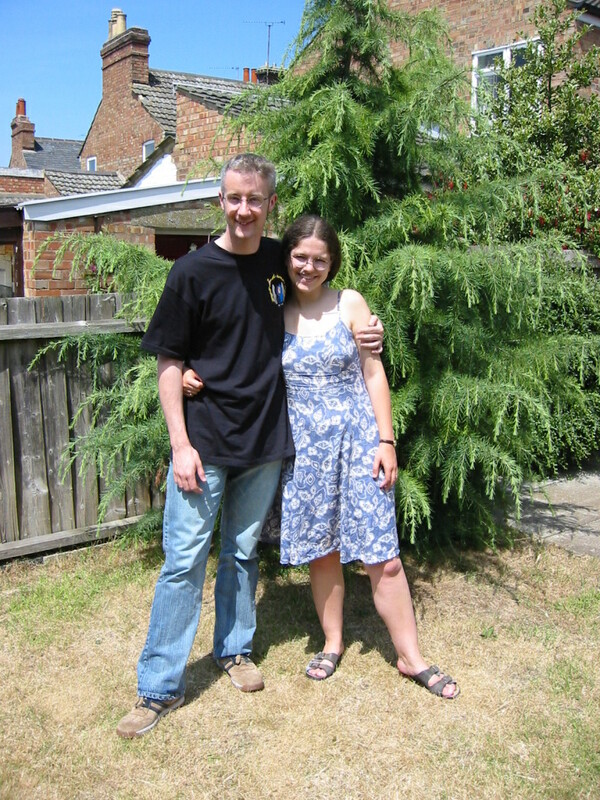 Edited: I couldn't find a pic of the garden and/or tree when we moved in, but this gives some feel for how the tree was about a year after we moved in (maybe it was a little over 6 foot when we first got there and maybe it didn't get quite to as tall as the house, but it was pretty damn tall). Current Music: Rachel Unthank & The Winterset "Cruel Sister"